We’d love your help. Let us know what’s wrong with this preview of Hi, Anxiety by Kat Kinsman. 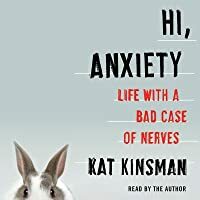 Joining the ranks of such acclaimed accounts as Manic, Brain on Fire, and Monkey Mind, a deeply personal, funny, and sometimes painful look at anxiety and its impact from writer and commentator Kat Kinsman. Feeling anxious? Can’t sleep because your brain won’t stop recycling thoughts? Unable to make a decision because you're too afraid you’ll make the wrong one? 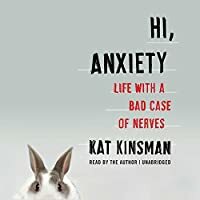 You’re not Joining the ranks of such acclaimed accounts as Manic, Brain on Fire, and Monkey Mind, a deeply personal, funny, and sometimes painful look at anxiety and its impact from writer and commentator Kat Kinsman. Feeling anxious? Can’t sleep because your brain won’t stop recycling thoughts? Unable to make a decision because you're too afraid you’ll make the wrong one? You’re not alone. In Hi, Anxiety, beloved food writer, editor, and commentator Kat Kinsman expands on the high profile pieces she wrote for CNN.com about depression, and its wicked cousin, anxiety. Taking us back to her adolescence, when she was diagnosed with depression at fourteen, Kat speaks eloquently with pathos and humor about her skin picking, hand flapping, “nervousness” that made her the recipient of many a harsh taunt. With her mother also gripped by depression and health issues throughout her life, Kat came to live in a constant state of unease—that she would fail, that she would never find love . . . that she would end up just like her mother. Now, as a successful media personality, Kat still battles anxiety every day. That anxiety manifests in strange, and deeply personal ways. But as she found when she started to write about her struggles, Kat is not alone in feeling like the simple act of leaving the house, or getting a haircut can be crippling. And though periodic medication, counseling, a successful career and a happy marriage have brought her relief, the illness, because that is what anxiety is, remains. To ask other readers questions about Hi, Anxiety, please sign up. Kinsman discusses her lifelong battle with depression and anxiety and explains why she believes people shouldn’t be afraid to come forward and get the help they need. A very brave and wonderful memoir, infused with a lot of humor and heart. She does a wonderful job bringing humor to a hard situation. Kat Kinsman is my twin, so I naturally feel sorry for her. Funny, wry, sometimes brutal memoir about life riddled with anxiety. I related far too much than I thought I would!! I've joked about being agoraphobic in the past, and this book made me realize: Oh hey, that's not really a joke, and also, you are definitely agoraphobic. This book made me realize that I was more anxious than I thought I was, and that I've been carrying it with me for my entire life. That this weight on my shoulders might not just be "the way it is" and instead it's "the way it is... with crippling, life-altering anxiety." I related to Kat Kinsman's life and her experiences more This book. Wow. I related to Kat Kinsman's life and her experiences more than I have ever related to an author, or any book. There were entire passages where I couldn't believe that I was reading a published book, not my own diary. Hiding in your house drinking only Diet Coke and being afraid to let anyone near your hot mess of a living situation? Been there, still kind of doing that (less mess, less Diet Coke, but still unpacked). Being in a relationship with someone you kind of despise, but you feel unworthy and you stay with them for way too long? Oh yeah. I lived that life for over two years. I even shared paragraphs with a friend of mine who also struggles, and her response? Who let someone write my biography without my permission???? JK but really tho as someone with intense anxiety issues I found so much of this book relatable. Some of Kat's deepest fear chapters gave me secondhand anxiety :&!! She comes off as very warm and genuine; it feels like reading about a friend. A+ book would recommend to people with anxiety and people in general. Some of the scenes from this were scarily familiar. Recommended for anyone with anxiety, or anyone trying to understand it. Jenny Lawson's 'Furiously Happy' may have ruined me for all future memoirs about mental health issues. I not only deeply identified with some aspect of Lawson's depiction of her mental health issues, but I was incredibly entertained by her gift of story telling. I also identified with some aspects of Kinsman experiences with anxiety. Unfortunately, I was just not entertained. It some parts of this book my anxiety was even triggered. This one was just not for me. This book touches on a lot of issues that I am quite familiar with. While my personal levels of anxiety differ from Kat's from situation (sometimes more, sometimes less), it's important to know that people have found ways to survive in this crazy, hectic, crowded world while dealing with the kind of thing I've been putting up with every day for as long as I can remember. The stories are both funny and sad, well presented, and heart-felt. This was an excellent read. I liked it. The author brings humor to something that is a scary thing. Suffering from anxiety and panic attacks myself, it was reassuring to read that I wasn't alone. Logically, I know I'm not the ONLY ONE but it's nice to read it. It's in print. It's there. And I'm not not alone. Really well written. Sometimes relatable, and other times not. I found the chronology to be very confusing. Various stories, even within the same essay, jump around in time and space in ways that are difficult to follow. 2.5 stars. The author is pretty unlikable and seems rather judgemental of other people’s definitions of mental illness. Also, half of her chapters on her “irrational fears” really aren’t all that irrational - they seem more of her personal opinions and preferences towards certain things and, to me, it felt like the underlying theme was “I think I’m special because I have this ‘irrational’ fear.” I don’t recommend if you are looking for mental health memoirs. This wasn't exactly what I thought it would be but it was still quite valuable. Be ready to be confronted with the true brokenness of anxiety and depression. It isn't pretty, but it is important. This big gave me the ability to truly empathize with those who struggle in this way and gave me greater awareness of why it should be discussed openly and not stigmatized. If you’ve ever wonder what life is like with anxiety...read this. This book was a tough read from the first pages, where her description of what she experiences as she prepares to leave for a trip hit way the hell close to home. So close to home that I asked my husband to read it, to give him some insight into what's happening inside my brain and the rest of my body when I insist that we leave 40 minutes early to catch the bus to the airport that is a 10-minute drive from our apartment. I had grabbed this from the library in large part because of her nomenclat This book was a tough read from the first pages, where her description of what she experiences as she prepares to leave for a trip hit way the hell close to home. So close to home that I asked my husband to read it, to give him some insight into what's happening inside my brain and the rest of my body when I insist that we leave 40 minutes early to catch the bus to the airport that is a 10-minute drive from our apartment. I had grabbed this from the library in large part because of her nomenclature in the title. "Nerves" was the term I heard growing up for what now would be referred to as depression or anxiety, the same way that "the sugar" was what people said instead of diabetes. So, I wasn't surprised to learn that Kinsman is from Kentucky/Ohio, just a state over but culturally rather similar to where I grew up. Kinsman is an experienced journalist and moves seamlessly between discussion of the humor and the not-so-great in her own life, in presenting how her mental illness has made the the person she is. Her Irrational Fears chapters made me laugh as well as nod my head in solidarity. Kat Kinsman has been dealing with anxiety and depression in their myriad forms her whole life, from her mother's retreats to her silent bedroom, to her own fearful hidings under the bed covers. Now "out" about her anxiety, Kinsman is done hiding what she has always felt, and is sharing her story. As someone who has been diagnosed with Generalized Anxiety Disorder, having people be so public and honest about their own struggles with anxiety means a lot to me. Kinsman does not shy away from the frequently brutal truths about her life, and does a service to others through her truth. I liked the way the book is structured, larger episodes interspersed with chapters about more specific fears, such as driving. Kinsman has a nice, flowing style of writing that lends itself well to her storytelling. It's not that I didn't like this aspect, but this is not an easy book to read. Sometimes I could feel Kinsman's anxiety right there with her, and had to step away from the book for a bit. wow! okay everyone needs to read this!! this is such an important book that deals with an issue that is so widespread but not talked about. and it does talk about it in such a delicate, honest and funny way. just amazing! Thank you for making me feel okay with myself, Kat. Thank you for being brave enough to share. A beautiful book about a tough subject. It read as if you were talking to a friend...someone who wanted to help you through by telling you her story. The title says anxiety in it, but Kinsman really comes across as a caring friend to anybody who has ever suffered or felt different. Funny and moving, couldn't recommend this more. I thought this book was really well written! Having gone through some of these struggles myself, the picture that Kat Kinsman paints for the reader is spot on. Obviously, anxiety is a different experience for each and every one of us, but it is a book that leaves the author vulnerable as she lets you in to her everyday struggles. Kinsman chooses her words carefully in order to make you feel what she does every minute of every day, which is why I couldn't seem to put the book down. The reason thi I thought this book was really well written! Having gone through some of these struggles myself, the picture that Kat Kinsman paints for the reader is spot on. Obviously, anxiety is a different experience for each and every one of us, but it is a book that leaves the author vulnerable as she lets you in to her everyday struggles. Kinsman chooses her words carefully in order to make you feel what she does every minute of every day, which is why I couldn't seem to put the book down. The reason this book did not get 5 stars is because while it was good and relateable, towards the end it started to get a little slow. 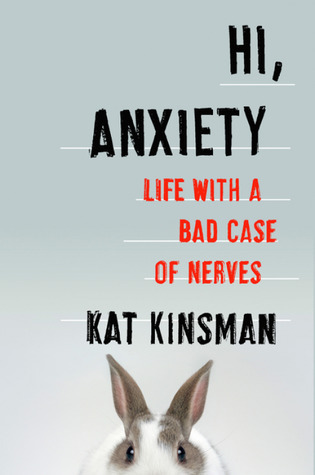 This book is a true story, but that being said, Kinsman's anxiety has not magically gone away in the process of writing this book. The plot isn't about how she magically overcame her anxiety; actually, it's the exact opposite. The book goes to show the reader that anxiety is an everyday chore that doesn't go away no matter how much you meditate, do yoga, eat healthy, or take "personal" days. This being said, I wouldn't read this book looking for a some sort of forward motion towards a solution, which is why after a while it was just more stories about being anxious. Again, I am in no way saying this is a bad thing, but it is something to keep in mind if you are looking for a book that is going to see some sort of change in the characters mentality throughout the book. At the end of the day, Kinsman still has to live with anxiety, and that is exactly what she portrays in this book; it does not go away, and the only thing we can do is learn to live with it - not get rid of it. Overall, I thoroughly enjoyed this book and WOULD recommend it, especially if you have had experience with severe anxiety in the past. I'm sure you'll find comfort in knowing that you're not the only one going through this struggle, and that your energy can indeed be channeled into something like writing a great book about the experiences you've had/what you've learned thus far. Right off the bat, the intro of Hi, Anxiety hit me like a ton of bricks. I want offer a trigger warning for those with anxiety and depression. You may well have an episode while reading this. I did when I read the intro and while it may have triggered me and took me completely by surprise, it hit home how this book was going to be a valuable piece on sharing the realities of anxiety. However, be aware that Kinsman will (obviously) talk about her experiences and gets detailed at times. Kinsman shares her experiences in an honest and open way. Hi, Anxiety is interlaced with stories of her irrational fears, which, as anyone with anxiety knows (or who knows someone with anxiety), irrational fears are what makes anxiety disorders. She speaks on the many areas of mental disease. Hi there! I'm Kat Kinsman, senior food and drinks editor at Time Inc.'s Extra Crispy, former editor in chief and editor at large of Tasting Table and a former writer and editor for CNN. After I published a personal essay on my struggles with anxiety, people came out of the woodwork to share their own experiences and it felt like the beginning of a conversation that needs to happen. http://www.cnn.c Hi there! I'm Kat Kinsman, senior food and drinks editor at Time Inc.'s Extra Crispy, former editor in chief and editor at large of Tasting Table and a former writer and editor for CNN. After I published a personal essay on my struggles with anxiety, people came out of the woodwork to share their own experiences and it felt like the beginning of a conversation that needs to happen. Stigma kills, and frank, open conversation is the best weapon against it. In my upcoming nonfiction book, "Hi, Anxiety," I share my stories of my lifelong battle with anxiety in the hopes that talking about it honestly and unapologetically will make other people feel less isolated and get the care they deserve.